Spindle thread inboard (R/h) 1.5" x 6 tpi. outboard (L/h) 1.5" x 6 tpi. 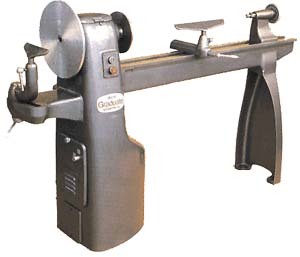 There is little needs saying about the 'Classic' range of Graduate lathes, highly sought after, regarded by most as the ultimate woodturning lathe in it's class. Robustly designed all cast iron construction giving a stable, quiet and virtually vibration free operation. Easy to use quick cam operation on the main operating components. A 4 speed 'vee' pulley drive system with a good speed range. The generously proportioned main spindle 40mm diameter carried on 80mm diameter deep groove ball bearings with 1.5" x 6 tpi threads give unsurpassed rigidity to face plates and chucks. L.R.E. 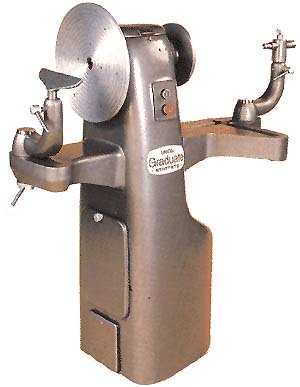 have specialized in re-building the Graduate lathes for over 25 years, over this period several hundred have passed through our well equipped workshop each being carefully rebuilt to exacting standards consisting of a complete strip down, thorough cleaning, replacing or re-machining damaged or worn parts. The main bed is re-ground, all levers handles etc. are replaced, refurbished and re-chromed. New electrical systems are installed. Finally the lathes are re-painted to a high standard in the original hammer finish grey colour. Due to the amount and detail of work carried out we offer a 12 month warranty with each machine, every lathe is supplied with the original level of standard equipment including a new parts/instruction manual. A full range of spare parts are available see 'Spares' page for details. L.R.E. Machinery & Equipment Co.